Oracle helps your media and entertainment (M&E) company address challenges in transitioning to and succeeding in the digital world. Plan for the future as you seek to attract, develop, and retain talent, and empower a collaborative digital workplace to improve productivity. Today's audiences consume what they want, when they want, wherever they are. Demand for innovation is high and content is still king. Media and entertainment (M&E) companies must innovate in terms of content, delivery, and overall user experience to delight and retain their user base. Competition for user engagement, talent, and consumer spend is more brutal than ever. Forward-thinking businesses have embraced digital's potential to create more direct and personalized distribution of content. Convergence is blurring defined lines between traditionally different industries (media, telecom, entertainment) and is driving exponential change across the entire media ecosystem and creating new growth opportunities. Digital pirates continued to swarm over entertainment in 2017, even with the rise of legal streaming services like Netflix and Spotify. 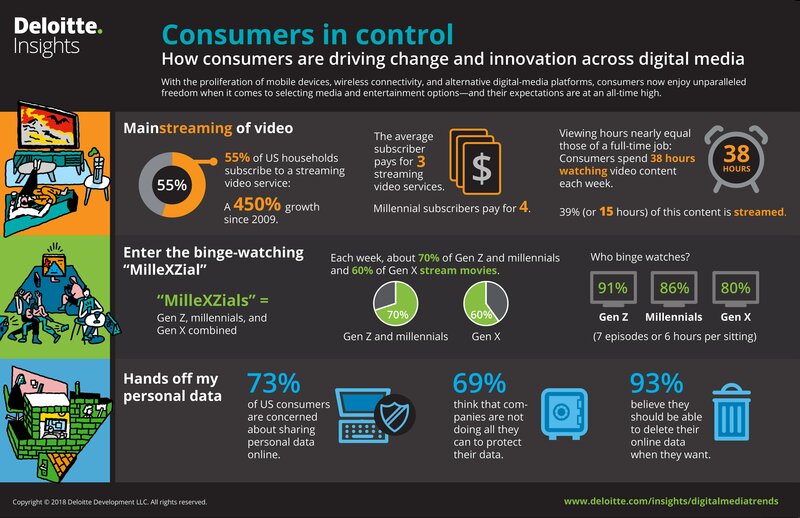 Consumer media consumption behavior is driving innovation and opening up new revenue streams for content creators. Media companies are capitalizing on emerging technologies such as augmented reality (AR), virtual reality (VR), and artificial intelligence (AI). This delivers more immersive consumer experiences and provides M&E companies with a competitive advantage. Direct-to-consumer demands are changing the way M&E companies do business. In order to be successful in this new world, M&E companies must not only create, market, and distribute content, but also build over-the-top (OTT) streaming platforms that curate ongoing and direct-to-customer relationships on a global scale. Digital Home Service (DHS) is a new cloud-based Oracle solution for set-top box and service-intensive pay TV operators that will deliver superior service to consumers and represent a break through in the ability to deliver an integrated platform to run a TV service business. DHS combines emerging technologies such as IoT, AI, mobile, chatbot, and remote video support with modern digital customer management to deliver the next generation capabilities of digital home services. With increased competition in content creation, delivery, and the transition to direct-to-consumer for many companies, efficient financial systems and processes are a must in the media and entertainment industry. Oracle Cloud technologies help M&E customers drive finance transformations through evolving M&E value chains to obtain greater visibility and insights into corporate and production financials. Oracle helps media and entertainment companies address the challenges they are facing to transition and succeed in the digital world; the battle for scale and for content origination leads M&E companies to anticipate the battle for talent. Oracle helps M&E companies plan for the future as they seek to attract, develop, and retain talent. This is accomplished in an increasingly digital and collaborative workplace by helping M&E companies respond to emerging trends in HR to support business transformation in a rapidly changing M&E environment.